I love all kinds of science including physics, space, chemistry, programing, and how the body works. 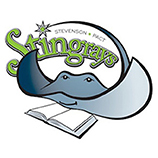 I like to run, and I like reading all kinds of books including fiction and nonfiction. I currently live in Northern California, and I am in fourth grade. 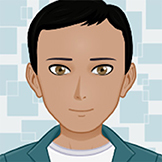 I spend time talking with my dad about science, playing a game called Minecraft (I like building stuff and survival), and I want to invent new stuff to improve people’s lives. I think it would be cool to invent a shrinking device and time travel machines. Astronomers think they have found a planet that has a giant set of rings around it, over 200 times larger than the rings around the planet Saturn. The planet is young enough that moons may be forming out of the material of the rings, and we are seeing the shadows of the rings here on Earth. We are now looking for other planets that have giant rings around them, and we may see rings in 2017 around the planet beta Pictoris b.
Astronomers have found many planets in our Galaxy by seeing when a planet moves in front of its parent star and blocks part of the starlight for a few hours. For planets as large as Jupiter, the diameter of the planet is about one tenth the diameter of the star, the amount of star light blocked by the planet is about one hundredth (1%) of the total star light. Since these new planets are not detected by seeing them directly, but by the change in the brightness of the star they move in front of, these signals can be measured with small telescopes. The first planet to be detected this way was found using a 4″ diameter telescope with a computer-controlled camera, by Professor David Charbonneau in 2000 . There are now many different telescopes around the world that take images of the night sky every few minutes or so, searching for the distinctive dip in star light that happens when a planet undergoes a transit of (moves across) its parent star. One of these transit-searching observatories is called SuperWASP (short for the Super Wide Angle Survey for Planets – see Figure 1), and it uses eight very powerful camera lenses connected to eight cameras to take pictures of the sky every night . More lenses would be more expensive to build and steer around the sky, and fewer lenses would mean that the surveys would take too long to do. By 2010, the cameras at SuperWASP had collected several years worth of data on over 18 million stars! The builders of the cameras knew that the data on the amount of blocked star light could also be used by other astronomers to study their favorite stars and to see what those stars were doing. 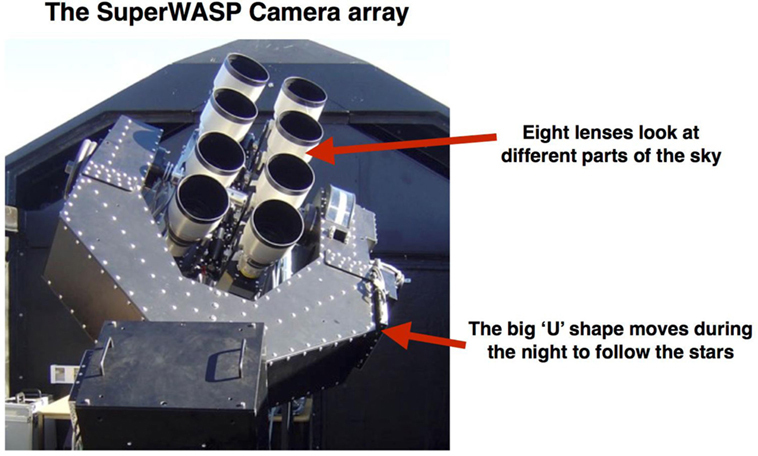 Figure 1 - Picture of the SuperWASP cameras. These small telescopes have been tremendously successful at finding many planets. Using telescopes on earth, over 300 planets have been seen moving in front of their stars, and this means that there are many more planets that we do not see, whose orbits do not quite line up with the Earth and these telescopes. The space satellite Kepler, launched in 2009, has detected over 1000 planets using the same method. But there is a problem. Telling computers to look for the decrease in star light that occurs when a planet moves in front of a star is difficult, because there are several other astronomical phenomena that look very similar to a planet moving in front of a star. 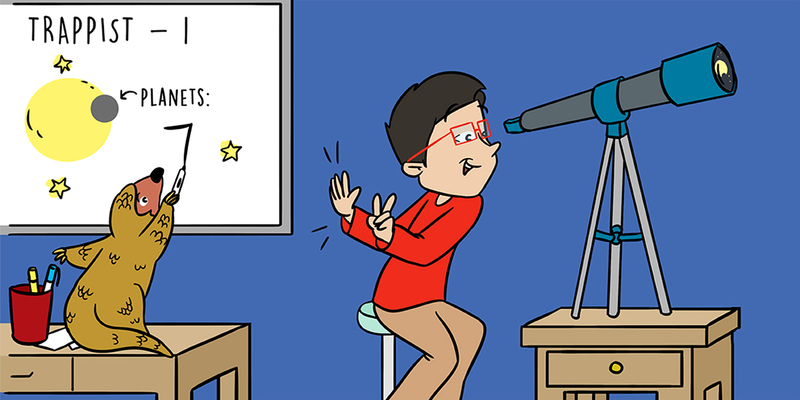 These are called false positives – one such false positive can occur if two stars that orbit each other happen to block one another’s light. This combination can look like a transiting planet. Other stars also vary their brightness, either because they puff up and collapse every few days, or because they have bright explosions on their surface, or because they are pulling star stuff off another star nearby. These phenomena can cause false positives, too. Because of false positives and the many other astronomical phenomena in the sky, the astronomers who built SuperWASP released all their data onto the Internet for other astronomers to download1 and look through for their own scientific interests, and that was how we found J1407. Eric Mamajek is a professor at the University of Rochester in the United States. He and his graduate student, Mark Pecaut, looked at lots of star light data in the SuperWASP database. Eric and Mark are both experts in finding very young stars, and two signs of a young star are (i) they have lots of star spots which look like black dots on their surface and are cooler regions on the star and (ii) they spin faster than older stars. Our Sun takes about 25 days to spin around once, but young stars take only 2–3 days to spin around. As very young stars spin around, the star spots on their surface come in and out of view, and this changes their light levels by a small amount. By looking at the light given off by these young stars, Eric and Mark can see the brightness change by a small and repeatable amount every time the star spins around, and the SuperWASP database was an ideal place to look for evidence of new stars. One of the stars they looked at is called J1407, and they saw that the light data from this star looked very strange. The full name of the star is 1SWASP J140747.93-394542.6, which comes from the coordinates of the star’s position in the sky, but we shortened it to J1407. For 2 years, the star acted normally, changing brightness by a few percent every 3.2 days, showing that is a fast rotating (and probably young) star. Then, in the middle of 2007, the star did something very unusual. Over the period of 2 months, the star faded away, brightened back up to normal, faded almost completely away for a week, and then reversed this pattern before going back to normal – see Figure 2. When the star faded away, it did so very, very quickly. Over one night, the light from the star dropped by more than 50%. What could cause such a thing to happen? Figure 2 - The light data obtained from J1407 in April and May 2007. The red dots are the light measured from the star. 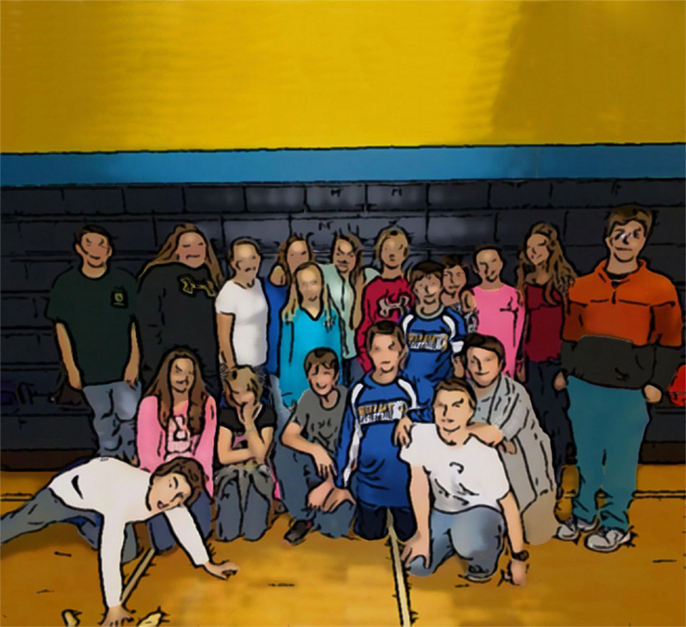 We made a picture of the rings in our computer and then made the star move behind these rings to see what the rings would look like from Earth. 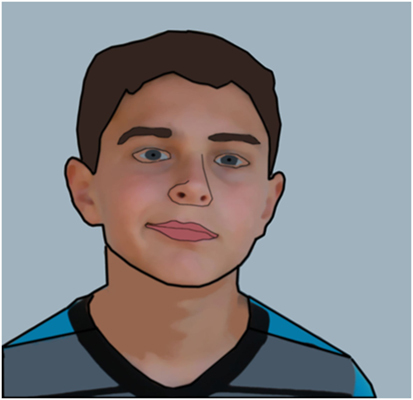 This is the green line in the picture above . 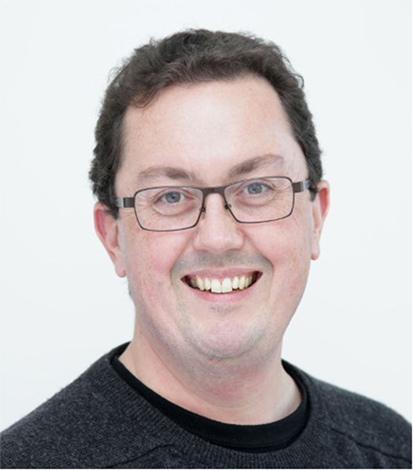 Eric showed me the star light data a few months later, and by now, several other astronomers were also looking at this data and trying to work out what was going on. We suggested several possible ideas as to what was happening – were we seeing a binary star system? No, the light data looked too complex. What could be going on? The only explanation we could think of that made sense was that we were seeing a load of small rings sitting inside bigger rings, such as those around Saturn, moving between us and the star. Given how quickly the star faded and brightened up gave us an idea of how fast these rings were moving and multiplying this speed by the number of days we saw the star flickering gave us an idea of the size of the rings – over 180 million kilometers in diameter! These rings would be as large as the orbit of Venus around the Sun (Figure 3). This was incredible. Figure 3 - Our best model of what the rings around J1407b look like. The green line shows where the star moves as it appears to move behind the rings. The blue dot is where J1407b is, the gray rings are where we do not have data from the SuperWASP cameras, and the different shades of red are the density of the rings . But where were these rings, were they around the star? No. The simplest explanation was that there was an unseen planet orbiting at a large distance around J1407, and that these rings were around this unseen planet (see Figure 4) – but these rings were over 200 times larger in diameter (more than 40,000 times in total area) than the rings around Saturn (see Figure 5)! How could this work? 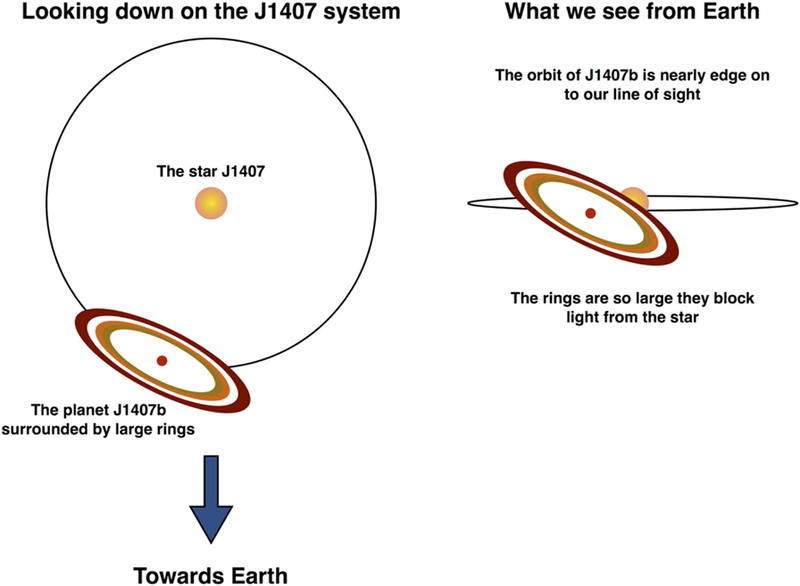 Figure 4 - The J1407 system as seen when you look down onto the orbit of the planet and when we are looking from the Earth. The planet J1407b orbits around the star, called J1407. The rings orbit around the planet, and both the planet and the rings move around the star. From Earth, the orbit of J1407b is seen almost edge on, and the rings block the light of the star. Credit: Kenworthy, Leiden. Figure 5 - The rings around J1407b are so large that if they were put around Saturn, we could see the rings at dusk with our own eyes and camera phones. 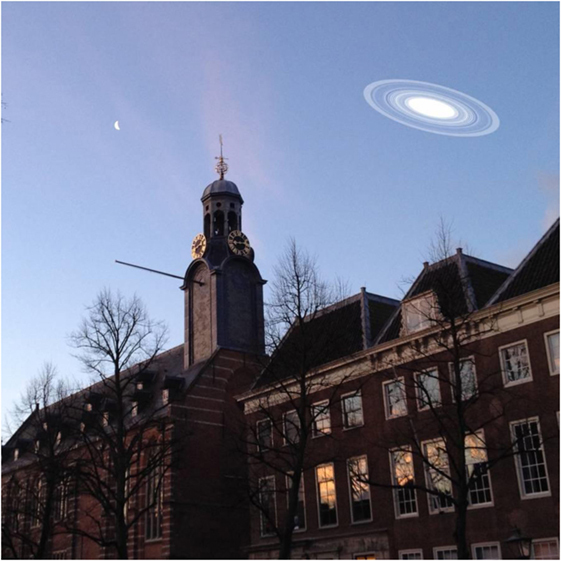 Here, the rings are seen in the skies of Leiden, above the Academiegebouw. Credit: Kenworthy, Leiden. Saturn almost certainly had a much larger ring system early on in its history, but that material has collapsed to form the moons of Saturn that we see today. Astronomers name planets after their parent stars starting with the letter “b.” Why “b” and not “a”? The reason is that the star is considered to be the first object in the system and is called “a,” so any planets found will be “b,” “c,” “d,” and so on. The planet J1407b has rings that will ultimately collapse into moons around it, and there may be Saturn-sized rings right next to the planet sometime in the next few million years. Once we saw that our light data indicated that there was a giant object floating in space around a star some 400 light years away, we used the world’s largest telescopes to try and take a picture of this amazing system. We knew that the telescopes were not powerful enough to see the individual rings, but we thought that maybe we could see the planet itself glowing at the center of the rings. To look for J1407b, we used cameras that see heat instead of the light we see with our eyes. All warm objects glow with heat energy, which has a wavelength that is three to four times longer than the light we see with our eyes. 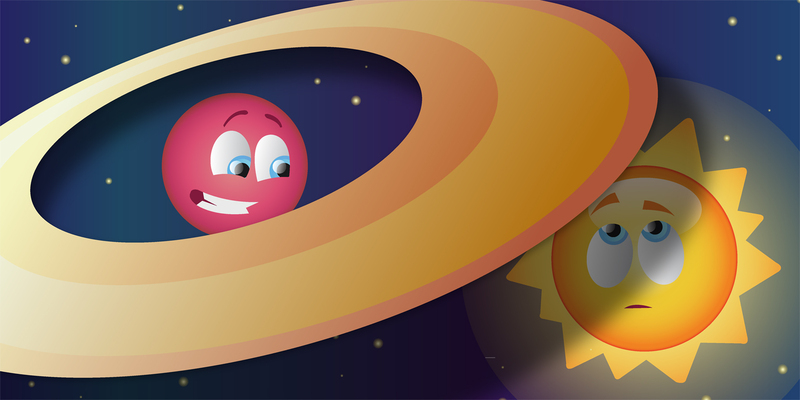 We expect to see this “heat glow” from the planet because a planet is a big dense ball of gas that heated up when it was formed, but the rings are made up of lots of tiny rocks that cooled off quickly, so we cannot detect the rings this way. We did not see anything next to the star when we looked with the heat-detecting telescope – but this does not mean the planet does not exist. We know that the rings are there, and you need a planet’s gravity to hold rings in place, so what the telescope data told us was that the planet was smaller than we thought it would be. Even with the world’s biggest telescopes, we cannot see very small planets, and so we know that the planet around J1407 is at most 80 times heavier than Jupiter, but not more than that, otherwise we would have seen the telltale heat glow with the telescope. 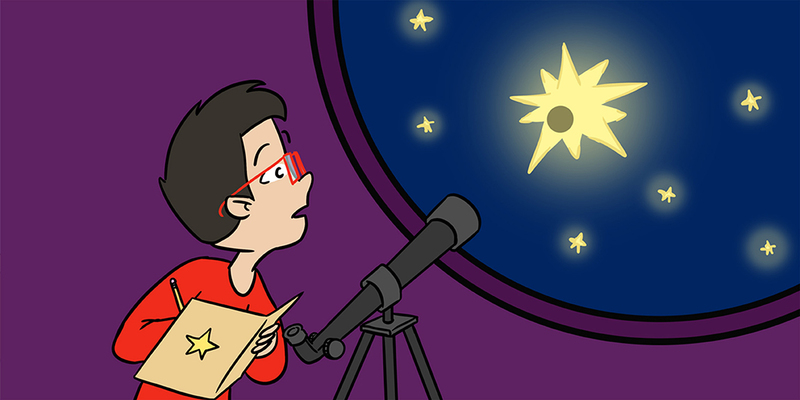 The star J1407 is relatively bright and can be seen using small telescopes, and so we asked amateur astronomers from around the world to look at the star and take pictures of it. We are now waiting for the rings to move in front of the star again, but we do not know exactly when this will happen. Our best calculated guess is that it will happen in the next 10 years – or it could start happening tomorrow! The best way to find out is to keep looking at the star and waiting for it to happen again. We can also look back through old data while we wait for the next transit to occur. Before digital cameras became a part of telescopes around the world, astronomers would use photographic plates to take pictures of the sky. Photographic plates are very thin sheets of glass about the size of your head, and they are coated with a special light-sensitive chemical that goes from clear to black when light hits it. These plates were put into telescopes in complete darkness, then pointed at the sky for many hours at a time, and then washed with chemicals in a dark room so that the astronomical objects appeared as dark blobs on the transparent glass plate. Many hundreds of thousands of photographic plates were taken of the night sky over the course of 100 years, and a collection of photographic plates at the Harvard Observatory – called the DASCH project – are being copied to a computer using a special scanning camera. We can use this old data to search for previous transits of the rings in front of J1407, and it is something we are still checking out right now. We would like to know when a planet will move in front of its star. And it just so happens that we have a star with a planet that will move in front of it in 2017 – the star is called beta Pictoris, and it has a planet that is about 10 times heavier than Jupiter in orbit around it, called beta Pictoris b. Pictures of this planet have been taken since its discovery in 2010 , and we can see that the orbit of the planet will move the planet in front of the star sometime in 2017. We cannot be sure exactly when this will happen, since the measurements of the exact position of the planet are very difficult to make with such a bright star next to it. We hope to take pictures of beta Pictoris over the next 2 years, and we will see if we can see the shadow of rings moving in front of the star. If we do see it happen, this will be very exciting, since astronomers from all over the world can see this very bright star and all of them can collect data together. And we have not given up on J1407 – we are patiently waiting to see when the rings start to move in front of the star again, signaling the start of 2 months of rings moving in front of the star. Will we see the same ring pattern? Will we be able to understand what material the rings are made out of? We will just have to wait and see! Transit: ↑ When one astronomical body passes in front of another astronomical body. False positive: ↑ A signal that incorrectly resembles the phenomena you are looking for. Binary star system: ↑ Two stars that orbit around their mutual centre of gravitational attraction. Submitted: May 9, 2016; Accepted: October 7, 2016; Published online: November 1, 2016.